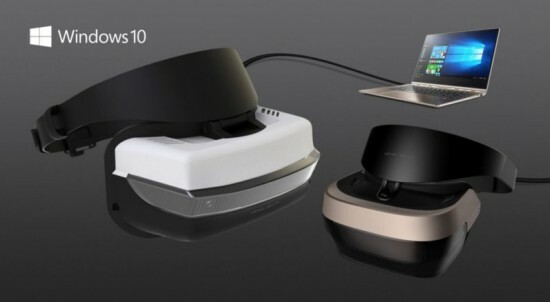 Microsoft started working in the increasing competitive field of Virtual Reality headsets, which are introduced by headsets for Windows. The VR headsets of Microsoft use six degree freedom tracking system and this technique are same to Rift of Oculus. Other than the Rift or Vive of HTC, they do not need to have any separate calibration hardware to function. Terry Myerson of Microsoft said that these headsets will be first and they are shipped with inside out six degree freedom sensors. Other than the VR headset on market today there will be zero need for the separate room and this zero need is for the complicated setup. Microsoft managed to blow the VR companies with very cheap price and the prices of these Windows VR headsets are started at $299. When the comparison is done between Rift and Vive, then you will find that Rift is available for $600 and Vive is available for $799. Microsoft says that the PC partners like Lenovo, HP, Dell, Asus and Acer will ship their headsets in Spring 2017 and in time for the upcoming Windows 10 Creators Updates. Now Microsoft has decided to step in VR field and they have been working on the augmented reality headset. Other than the augmented policy, there big players in Virtual Reality field and facebook bought Oculus for Rift and HTC has gone with Vie VR and Google has ventured the mobile platforms with recently declared Daydream VR.